With a total of 97 percent, Saxony's high-tech network once again demonstrated its outstanding European position and was successfully recertified for the third time receiving the Gold Label certification from the European Cluster Excellence Initiative (ECEI). In March 2012, Silicon Saxony e. V. was the first German cluster ever to receive the Gold Label certification from the European Cluster Excellence Initiative (ECEI). With an already impressive 88 percent, Saxony's largest microelectronics and ICT network verified the excellent quality and performance of the cluster management. 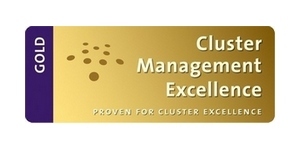 For three years the award "Cluster Organization Management Excellence Label (Quality Label) GOLD" was awarded. In 2015, the first recertification followed. Once again Silicon Saxony underlined its excellent organization. Once again, a strong result of 88 percent were achieved and the network once again received the ECEI quality label. End of 2018 Silicon Saxony went through the certification process for the third time and achieved a new impressive record. This makes it one of 42 clusters worldwide that carry the Gold Label. 566 clusters are globally certified and carry one of the three quality labels (gold, silver, bronze). With a total of 97 percent, Saxony's high-tech network once again demonstrated its outstanding European position. Significant improvements were achieved in all evaluation criteria. In terms of content and organization, the stringent examiners of the European Secretariat for Cluster Analysis (ESCA) were convinced of the continuously improved processes and competencies. "We remain ambitious and continue to strive to achieve the best possible results for our approximately 350 members, and we will not rest on our laurels, but will continue to work hard on ourselves", explains Frank Bösenberg, Managing Director and Member of the Executive Board of Silicon Saxony e. V.
In addition to the further sharpening and strengthening of microelectronics and hardware as well as software, it is necessary to explore cooperation potentials of both target groups, to use them and to promote them in co-responsible projects, such as the Smart Systems Hub in Dresden. The goal is to support the entire cluster and thus the entire ICT value chain of Saxony as a top business location. The gold label is therefore more than an award for the office of Silicon Saxony e. V. It is the confirmation of the excellent work in and for Saxony, both on the part of the network organization as well as the countless voluntary supporters and committed members, without whom this success would have been unthinkable. About Silicon Saxony e. V.